Our Shea Essential Skin Hyper-pigmentation Solution consist of five superior products that are designed to enable you to overcome the visible affect of dark spots or patches (liver spots, age spots, old insect bites, acne spots, dark knees or elbows etc.) and the appearance of hyper-pigmentation on All Skin Surfaces. Our Shea Essential Skin Hyper-pigmentation System consist of five superior products that are designed to enable you to overcome the appearance of hyper-pigmentation on All Skin Surfaces. Liquefied Black Soap is a All Natural Soap that cleanses the hair and body completely and leaves no residue of any kind. 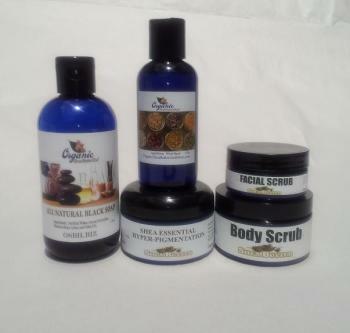 Black Soap has no sulfates or synthetic chemicals that are harmful to the hair follicles or skin lipid. Liquefied Black Soap is highly concentrated so a little goes a long way. Witch Hazel Extract Distillate has anti-inflammatory effect on skin which is useful in inflammatory skin disorders like eczema, psoriasis and acne. Witch Hazel Extract Distillate also has anti-microbial effect on skin which kills bacteria, viruses and fungi. Witch hazel Extract can also be used as a astringent to remove dirt and oil from the skin, reduce razor burn and can help to decrease puffy skin, bags under the eyes and pore size. Shea Butter Facial Scrub is a creamy textured facial scrub with tiny jojoba beads that safely and gently exfoliate (remove dead skin cells) the face. This is a 90% Organic Facial Scrub with Organic Rooibos red bush tea botanical extract (a free radical scavenger). Our Facial Scrub will leave your face cleansed, tighten and polished. This Treatment will prepare your face to be regenerated by our Shea Essential Hyper-pigmentation. Shea Butter Body Scrub is a creamy textured body scrub which uses ground walnut shells to gently exfoliate (remove dead skin cells) the body. Our Body Scrub is designed to exfoliate even the roughest part of the body, revealing a new layer of smooth, shiny and healthy skin. This Treatment will prepare your body to be regenerated by our Shea Essential Hyper-pigmentation. Shea Essential Hyper-pigmentation is made with Certified Virgin Organic Shea Butter Blended with Niacinamide, N-acetyl glucosamine and our specialized Organic Seed and Organic Essential Oil Blend designed to reduce the appearance of dark spots, pigmentation and deeply moisturizes the skin. Organic Shea Butter is Organic UV protection which is also important in the management of Hyper-pigmentation. We use Niacinamide and N-acetyl glucosamine in this Formulation which the following study confirms its effectiveness at reducing the detectable area of facial spots and the appearance of pigmentation. Reduction in the appearance of facial hyper-pigmentation after use of moisturizers with a combination of topical niacinamide and N-acetyl glucosamine: results of a randomized, double-blind, vehicle-controlled trial. Source: Harvard Medical School, Boston, MA 02114, USA. BACKGROUND: Topical niacinamide and N-acetyl glucosamine (NAG) each individually inhibit epidermal pigmentation in cell culture. In small clinical studies, niacinamide-containing and NAG-containing formulations reduced the appearance of hyperpigmentation. OBJECTIVES: To assess the effect of a combination of niacinamide and NAG in a topical moisturizing formulation on irregular facial pigmentation, including specific detection of changes in colour features associated with melanin. RESULTS: By all four measures, the niacinamide + NAG formulation regimen was significantly (P < 0.05) more effective than the vehicle control formulation regimen in reducing the detectable area of facial spots and the appearance of pigmentation. Thank You for shopping with us, come again soon! SOLUTIONS - This store is powered by ShopSite web catalog software.